Low available light can be one of the most frustrating conditions in which photographers are forced to work. The lack of contrast and image definition make it difficult, in not impossible, to bring your subject into sharp focus. Heavy shadows, dimly lit rooms and evening shooting schedules often result in soft images, not to mention tired and sore eyes (worse if you have sleep apnea troubles). Beattie Intenscreen bright focusing screens help eliminate these problems making it easier to get the perfect shot. This product has been responsible for many important photographic awards, is the key choice for precise media vehicles and will continue to perform for new users. 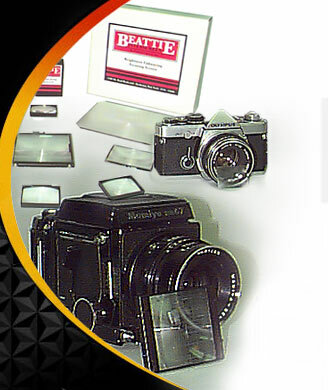 Beattie Intenscreen offers a wide variety of brightness enhancing focusing screens, with over 350 screens available. While it is impossible to offer a screen for every camera, Intenscreen is available for hundreds of the most popular 35mm, medium format and large format cameras. And, several screen variations including grid patterns and split image focus are available within each camera model product category. To place an order or to find out which screens are available for a particular camera model, use the Intenscreen Product Search.